the LanguageTool for LibreOffice/OpenOffice didn’t check the spelling mistakes. As you see in the first image i have installed both the LanguageTool and Hunspell. Hunspell is correct recognized as spelling tool. The LanguageTool is only recognized as grammar tool, but not as spelling tool, too. 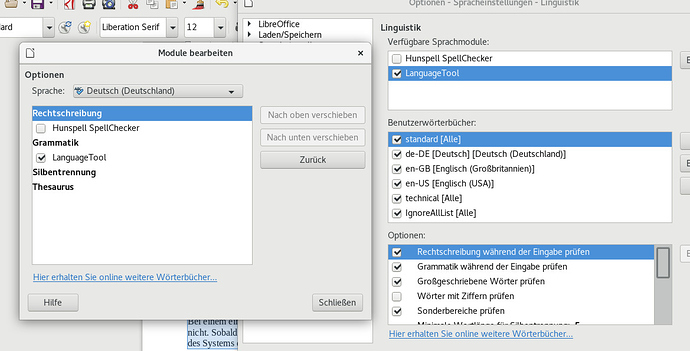 You can’t select any language dictionary because LanguageTool is only recognized as grammar tool. I have Java 1.8.0_141, LibreOffice 5.3.4.2 and LanguageTool 3.8. LanguageTool, to my knowledge, uses third-party spellcheckers (like Hunspell) allowing it to focus on the main task of checking grammar. Most languages have integrated spellchecking checking as a “grammar” rule, and well-developed languages have a much more developed spellchecking than the “vanilla” Hunspell dictionaries. Since most people do not deactivate Hunspell in LibreOffice, it would not make sense to add that extra rule. In order to take advantage of this feature you will have to activate it in LanguageTool plug-in options. Note that, inside LibreOffice, all errors detected by LanguageTool rules (including spellchecking errors) will be underlined in blue. There is already a bug report/improvement suggestion in LibreOffice page, but it didn’t get enough support to have their developers look into the issue.